Home / Latest News / Is a spokesperson/animal right for your business? Is a spokesperson/animal right for your business? Keeping conversations open with customers is how to maintain those relationships. There are different ways to engage in conversation, a spokesperson/animal is one such method. Whether a spokesanimal is right for your business depends on your business culture. What is your business plan? What is the image you want to project? How best can you tell your story? Having a spokesanimal or cartoon character does not necessarily mean a business is taking things lightly. Sometimes it’s more a matter of how to best relate your story best to your public. A few examples should help explain. Perhaps the most famous, modern spokesanimal is the Geico gecko. Other famous spokes animals include the Chick-fil-A cows, the Energizer Bunny, Smokey the Bear and even Belinda the Spokesrabbit. Each one of these animals carries a different message. The Chick-fil-A Holstein cows who encourage hungry humans to eat chicken is not only cute, but actually conveys a tongue-in-cheek message about ingredient quality of the common hamburger joint. While the Energizer Bunny is memorable, there is some controversy as to its effectiveness. Many consumers confuse Energizer and Duracell brands; both companies have used rabbits in their marketing. This example demonstrates the need to research thoroughly and be sure your message will not confuse your public. 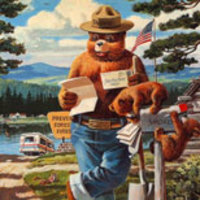 Smokey the Bear is a classic example of a spokesanimal/cartoon carrying a serious message. Use of the bear conveys to the public bears are at risk of death from forest fires; Smokey strongly conveys the message that human behavior is essential to prevent fires. Belinda the Spokesrabbit for Small Pet Select, is a very serious bunny who communicates to the public how serious rabbits can be. Belinda’s hireling, Abigail, another rabbit, shares posts about living with humans in such a way that not only is it a captivating story, but the public is educated about rabbits in general, and premium rabbit food offerings specifically. These examples demonstrate that spokesanimals/cartoon animals can help communicate with your public. What is right for your business depends on your business image. Regardless of your choice, sharing a consistent and truthful message with your consumers on a regular basis is critical to good public image. This not only creates brand loyalty but builds relationships. Previous Is there only one kind of recall? Next What is 5-log reduction?